Ricky has proven with determination anything is possible, he’s taken off his limiting beliefs with his parents help. 5 yrs.ago, it was a dream. 4 & a half yrs. ago, it became a goal. Today, it is REALITY. 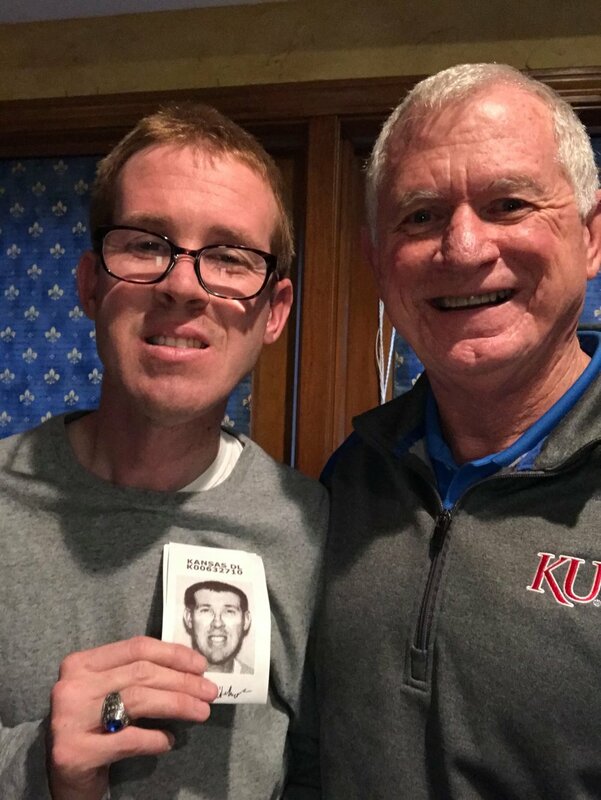 Ricky received his unrestricted KS Driver’s License today! 1st shout out for this accomplishment goes to George Hersh & Mark Hersh, owners of Pheno Brain Training. Ricky was George’s first student in March 2013. Ricky has recently completed 1,058 days of working the program. He set the goal, worked the process, gained respect for himself, controlled his emotions, persevered with integrity through each challenge & adversity until he attained success. Never once did he say, “I don’t want to do it today.” Many days he did the exercises by himself. His dedication was inspirational to be a part of this journey. They never determined what caused the seizures or why they stopped happening at age five. Ricky has been off all medications since age eight. Ricky’s development was very delayed. He did not walk until he was about two. He didn’t talk until age 4-5. Both his gross and fine motor skills were very affected by the brain damage so his balance and coordination have been very poor causing him to fall frequently resulting in many bumps, bruises and stitches. Ricky went through the Blue Valley Special Education program from pre-school at age 3 through high school and the Access Program when he graduated at age 21. Ricky was reading at about a third grade level and his math skills were about the same. Ricky is able to work at both McDonalds and Price Chopper grocery store. He can not drive but he takes great pleasure in riding his bike. He has a great personality and he knows a lot of people because he is very outgoing and personable. Ricky started the Pheno Brain Training program on March 15, 2013. While the program is not really designed for mentally delayed people I decided to enroll him based on reading about the program and my belief that he could benefit from the physical and mental exercises. Many of the symptoms that people with regular learning disabilities display were more pronounced in Ricky, so we decided to give it a try. We just finished week 52 in the program and we have experienced amazing results! 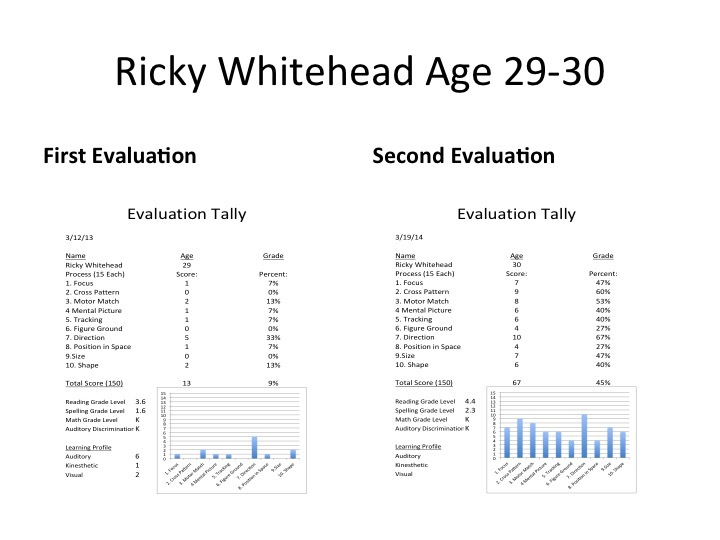 One of the first big things we noticed was a dramatic improvement in Ricky’s behavior and attitude. This result alone would have been worth the time and effort expended. While Ricky was very nice and pleasant in public and at work he would come home and he was very angry and disruptive. I believe it was because he was very frustrated, feeling like he did not have control over anything in his life. He was constantly telling us he was going to quit work because he didn’t like certain people there. He also told us he was moving out of our house because he didn’t like our rules. He went so far as to pack a bag every week for about a year before he left for Church on Sunday nights telling us he wasn’t coming home. It often ended with shouting matches between Ricky and parents or siblings. Approximately two months into the program all of that behavior stopped and it has not reoccurred since. I believe it is the result of Ricky finding out that he could accomplish things and do things that he had never been able to do before. Every exercise presented to him as part of the Pheno Brain Training Program, he has been able to master over time and move on to others. He began to do physical things that he was never able to do like jump and get both feet off the ground, throw and catch a ball with either hand, march with raising opposite hands and legs and maintaining focus on a task without being distracted at the slightest sound or movement! His self-esteem soared and this resulted in him having much better control of his emotions. Ricky has always had a tremendous memory, but now he can combine that with much better visualization skills. This program has led to improved writing, reading and spelling. He actually wrote his first letter without prompting to his sister who is away at college! It is almost a miracle to me to see the progress Ricky has made and we aren’t finished yet! While I don’t know how much farther he will ultimately progress he has yet to face a challenge that he wasn’t able to overcome. 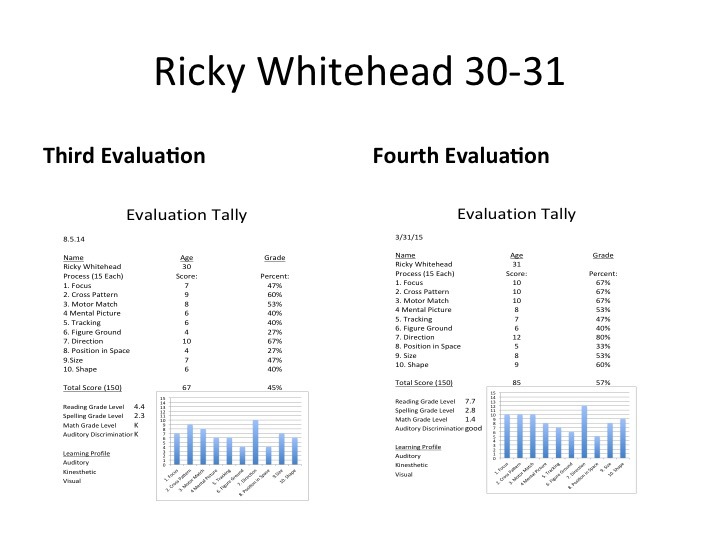 Ricky and Tom Whitehead Picture for Pheno Brain Training. My goal for Ricky is to be able for him to acquire a driver’s license and to be able to find higher level work to utilize his full potential! I have wondered at times where Ricky’s progress might have been, had I known about Pheno Brain Training Program ten or twenty years ago. Rather than focus on that, we are moving forward with the program and I believe Ricky’s future is much brighter because of Pheno Brain Training Program.